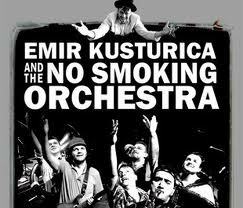 Have you ever seen Emir Kusturica and the No Smoking Orchestra? If not, do everything you can to catch a performance. I have just been to the Celtic Connections festival in Glasgow and we took a punt on our last night and went to see them. These guys — Serbian gentlemen of a certain age — aren’t just good, or brilliant — they break the boundaries of brilliant and shoot right out into their own eccentric, electric and utterly thrilling orbit, taking us with them of course. Yet they looked as if they’d pulled their clothes from a skip — the front man, whose name I cannot discover — wore a kneelength priest’s frock with bare legs. socks and shoes. He had a crew cut and glasses. He played the fiddle with jaunty insouciance while bouncing around the stage like a crazy kid’s toy. Girls danced like maenads in front of the stage, flinging their heads back as if possessed, resisting the efforts of portly security guards to control them. Emir made satiric comments about the security and said he hoped Scotlandwould soon be independent. Soon the stage was filled with young people bouncing up and down in ecstasy. The music was a kind of revved up gypsy-Balkan oompah sound, but played with such verve and mastery that my nervous system did not know whether to laugh or cry. I felt I was watching a band of magicians put a spell on the audience, leading us right to the very edge of chaos like scruffy Pied Pipers. I wanted to go with them, but something was bugging me, keeping me in my seat, rather than making me jump up to join the dancers, like I usually would. There was actually no coarse ribaldry, no sexism and no violence, so it wasn’t that. They behaved impeccably to the young Lithuanian woman invited on stage to play Juliet in a song about the Shakespeare play and she looked as if she thoroughly enjoyed it. No, it wasn’t the frenzy that troubled me, but the mocking of the portly security guards. They would be tough, underpaid Glaswegians from the rough parts of town. Like us, they were no longer young. They didn’t seem like a fair target.